Cook recently exhibited alongside 40 international artists including Turner Prize-winner Grayson Perry and pioneering sculpturist Gavin Turk in aid of The Green Party. 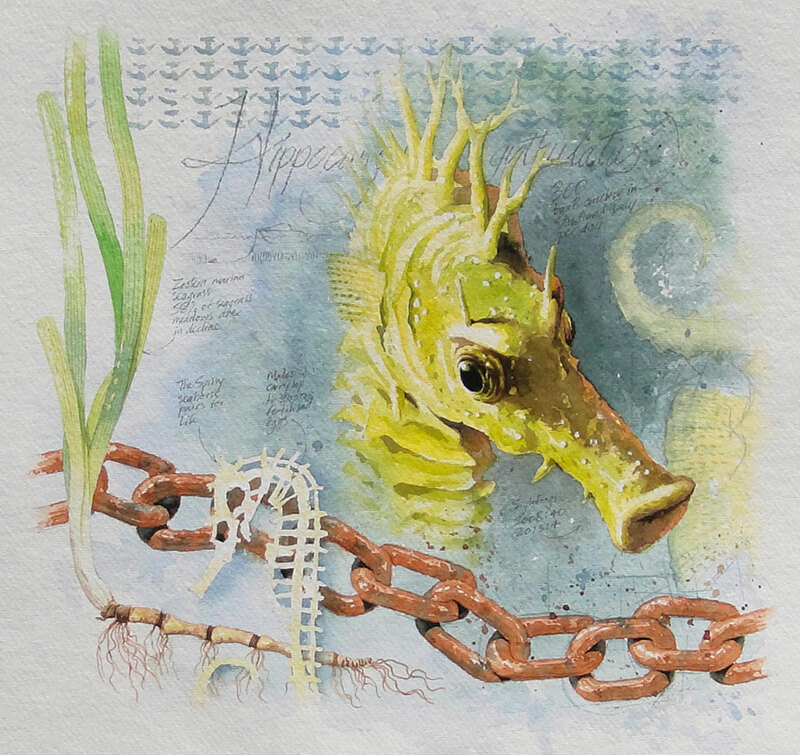 Studland seahorse IV – Endangered Spiny seahorses breed in Studland Bay. Unfortunately, during the summer 300 boats per day drop anchor there, inadvertently killing the sea grasses these exotic fish call home. As a consequence seahorse sightings in the bay are becoming rarer. 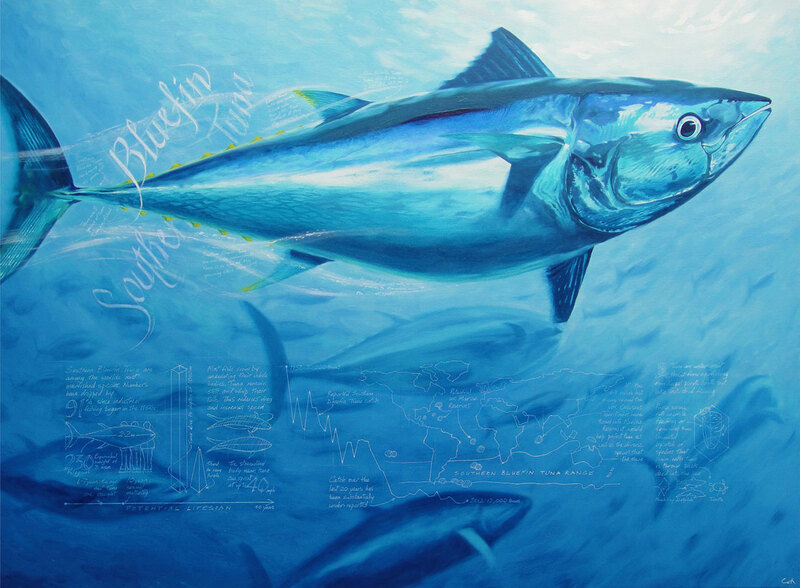 High stakes – I’ve seen tuna while diving on holiday and was amazed at their size, sleekness and silky beauty. Southern Bluefin Tuna are critically endangered yet we are still overfishing them, mostly before they are sexually mature. As a result, it is thought that only 9% of these 7ft-long fish remain worldwide. I was lucky enough to see six of these sleek mammals in a river close to me in Dorset. 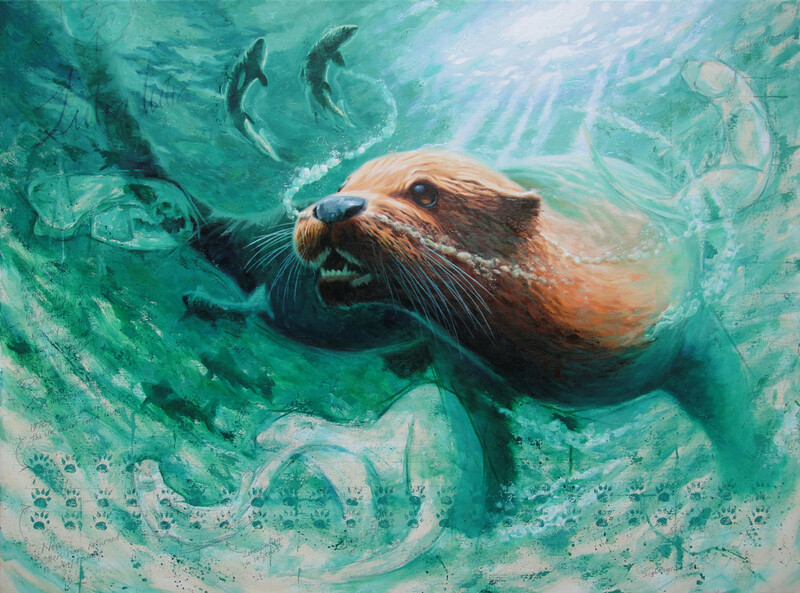 Otters vanished from most of the UK in the 1970s due to toxic pesticides, hunting and habitat loss. By banning the chemicals and hunting they have returned to most of the country. 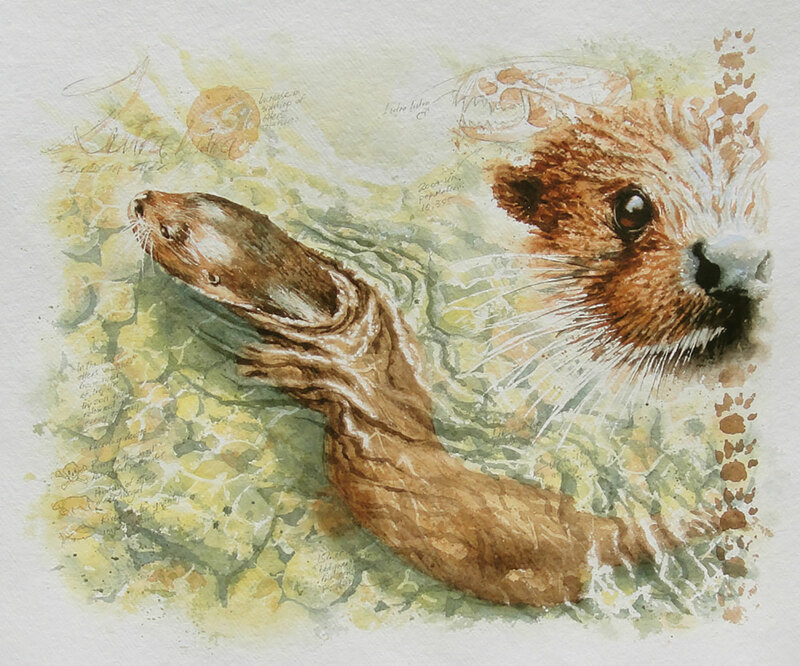 Sketching the otters I saw was so difficult. They are constantly moving effortlessly through the water. It’s great to have them return to our rivers. 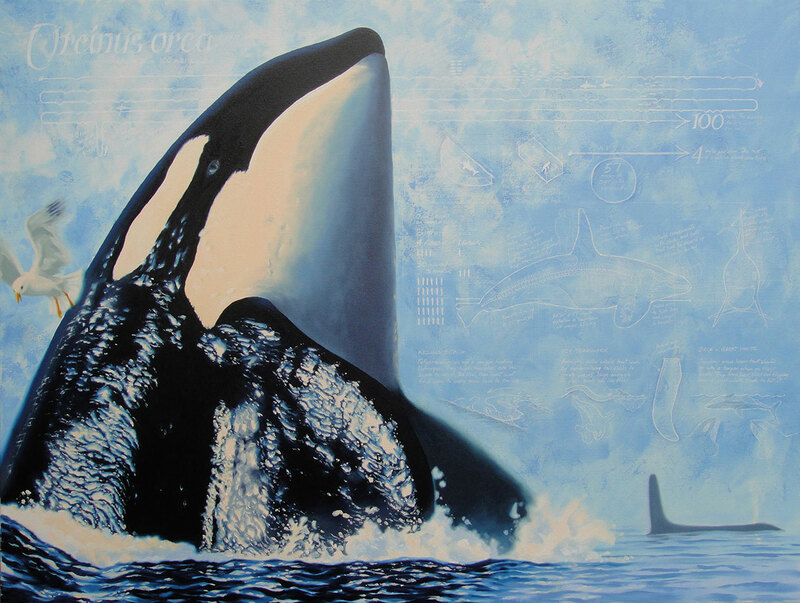 Killing whales – In the wild, killer whales swim 100 miles per day. FIfty-seven are kept in tanks at theme parks. These tanks are so small that even if they swim in circles all day they can only manage four miles. The elephant in the room – The inspiration for this infocanvas, was the shocking facts of man’s effect on elephants. With 93 a day being killed for their ivory, it really is something we need to talk about. 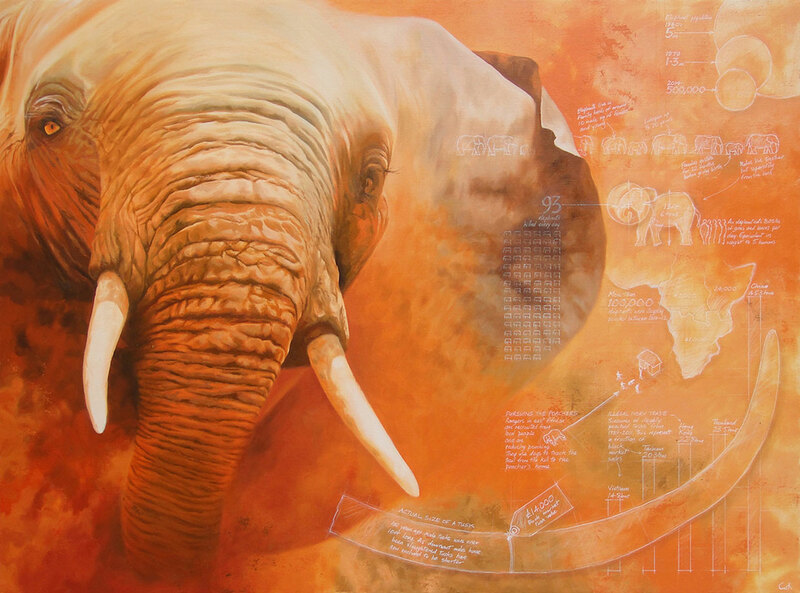 The canvas reveals how elephants have been reduced from a global population of 5m in the 1930s to just 500,000 now. 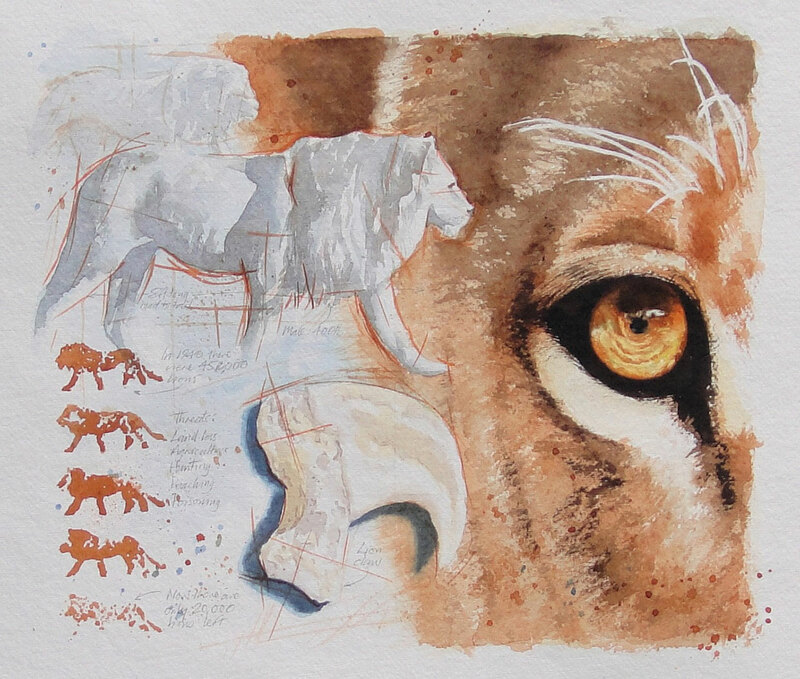 Vulnerable III – The killing of Cecil the lion shocked people about the world of big game hunting. This and other man-made dangers mean these 400lb predators are now, according to the IUCN ‘Vulnerable’. In 1940 there were 450,000 wild lions, through our actions there are only 20,000 left.